Over the past fifteen years, cities throughout Latin America have achieved a modest, yet significant, revolution in urban design through the adoption and refinement of Bus Rapid Transit (BRT) systems. Promising the benefits of developed world transit systems at developing world prices, BRT has quickly become a popular policy initiative among national and municipal level Latin American policymakers charged with reducing the crippling congestion, choking pollution, and alarming accident rates characteristic of the largely unregulated bus transit systems in most cities throughout the region. Pioneered in the mid-sized Brazilian city of Curitiba in the 1970s, Bus Rapid Transit increased bus speeds and improved road safety by placing high-capacity buses within committed bus lanes which channel buses to a series of fixed stations, similar to light-rail or metro systems. Inspired by the success of Curitiba’s system, cities such as Bogotá and Quito have more recently made BRT the linchpin of their transit network, to considerable acclaim from the riding public and international observers alike. BRT constitutes an important step towards resolving the problems of spatial distribution that afflict Latin American cities. Most Latin American mass transit systems are composed of slow, overcrowded, and expensive private bus lines incapable of meeting the challenges of tremendous urban sprawl. Moreover, most commuters must travel great distances from homes situated on the periphery of cities to centrally located jobs. Quito’s approximately 1,842,000 inhabitants, for example, take up 4,204 square kilometers, which is equivalent to one-tenth the population of the New York metropolitan area occupying one-fourth the territory. As a fast, reliable, and cost-effective means of transportation, BRT can effectively alleviate the structural inefficiencies of this sprawl. The near-universal complexity of urban problems makes successes all the more significant, accounting for the singular popularity of BRT. BRT’s proven track record makes it an appealing proposition to voters disillusioned by corruption, municipal incapacity and empty promises. Competent, effective execution of BRT plans has raised the approval ratings of some municipal politicians to record heights, even helping propel the former mayor of Quito, Jaime Mahuad, to the Ecuadorian presidency. National government interventions in troubled commuter projects like Santiago’s Transantiago underscore the centrality of urban transit issues not only to individual cities, but also to entire nations in South America, the world’s most urbanized continent. Ultimately, paying attention to vital urban issues is politically profitable in Latin America. None of this should imply that BRT has been an unmitigated success, nor that its introduction has been universally welcomed. Despite the simplicity of the basic concept, BRT systems are technically complex and require effective management. Where technical competency or strategic vision was found lacking, BRT systems floundered and caused as many problems as they aimed to resolve. Where problems emerge, adjustments can be difficult to make once a system is in place, and required political compromises may handicap its operation. For this reason, this report is broken into two sections. The first section will detail the structure and impact of successful BRT systems, while the second, forthcoming section will assess the technical and political difficulties of adopting BRT and deliver specific recommendations to those who do. Accordingly, this section’s positive depiction of BRT should not be interpreted as an unqualified endorsement. Rather, it should be seen an account of BRT at its best, which will be balanced by the more critical exposition in the second section. This report aims not to portray BRT as a miracle technology but rather a cost-effective, incremental improvement on the traditional setup of Latin American urban bus mass transit. Traditional Latin American mass transit systems are typically composed of slow, overcrowded, and expensive private bus lines. The system of management by private operators encourages the proliferation of buses and results in frequent traffic accidents. Chronic shortfalls of municipal resources and regulatory capture by bus operators engender lackluster oversight. Buses themselves are often too small, poorly maintained, and highly polluting. Fares are unconscionably high and frequent transfers double or triple the cost of commuting for the overwhelmingly poor bus-riding public. Worst of all is the constant, seemingly incurable gridlock. These market failures ultimately can be attributed to the poor design and perverse incentives of traditional systems. Regulatory failure and ill-advised bus operation schemes are the root causes of traditional Latin American bus systems’ dysfunction. In most cities in the region, bus transit has long been left to private operators. Barriers to entrance are low and returns on investment steady for small-scale operators in countries characterized by chronic underemployment. As bus transit systems spread throughout Latin America, citywide bus operation companies soon arose to manage routes and limit competition. These companies found that passengers would shoulder higher fares rather than wait for another bus and began to raise prices accordingly. These higher fares in turn spurred infeasible numbers of entrants to buy in to operating companies in the hopes of reaping high profits. This increased congestion and produced chaotic routes as bus operators catered to increasingly niche markets. Meanwhile, operating companies receiving massive profits from driver buy-ins encouraged the process to proceed well beyond the economic equilibrium point. This resulted in a catastrophic oversupply of buses, high costs for impoverished commuters, and massive congestion. Existing bus mass transit not only imposes economic costs but also imperils the health and safety of other street users. The unfortunate corollary to the bus surplus is the universally-practiced pay-per-passenger driver remuneration scheme. The difficulty of making a decent living under this scheme (with so many buses on the roads) fosters a hyper-competitive atmosphere among bus drivers. In cities largely bereft of established bus stops, drivers barrel down on potential passengers without regard for other vehicles or pedestrians. As a consequence, traffic-related injury rates on the streets of Latin America are shockingly high (creating yet more congestion). A 2006 study found that on average, one person died every three days from traffic accidents involving buses in Santiago, Chile. Pollution from bus emissions further imperils the health of urban residents, especially in cities like Quito, Bogotá, or Santiago which are situated in valleys that trap and concentrate pollutants. Prior to the introduction of BRT to Quito in 1995, the economic costs alone of respiratory ailments from suspended particulate matter in the city totaled over $28 million in damages and over 5 million days of reduced or lost economic activity. Over 80% of these suspended particulates came from vehicular emissions. In design and function, Bus Rapid Transit systems are essentially above ground metro systems. Equipped with stations, exclusive lanes, and prepaid fare collection, they are far more efficient than the loosely regulated private bus lines typical of contemporary Latin American urban mass transit systems. All BRT systems follow the basic infrastructural model pioneered by Curitiba, Brazil in the 1970s. City officials create BRT lines by setting aside two or four lanes exclusively for BRT buses and constructing low physical barriers to separate them from normal traffic. This arrangement improves average bus speeds and, in four lane systems, permits express buses to overtake local buses. Passengers wait for buses at raised, covered, and usually fully enclosed stations placed at intervals of approximately 400 meters along a route. Most systems feature electronic boards at these stations listing the arrival times of incoming buses. Doors on the sides of specially designed buses align with openings in the station enclosures, forcing passengers to board and disembark at controlled points, much like a metro system. Additionally, some buses have distinct entrance and exit doors to increase the efficiency of the boarding process. Passengers prepay for BRT at the station instead of on the bus, decreasing loading times, reducing distractions for bus drivers, and minimizing ticket fraud. Well-designed BRT systems like Bogotá’s feature crosswalks or walkovers to facilitate pedestrian access to the stations, which by necessity stand on raised islands in the center of the street. BRT buses not only meet the needs of station design, they accommodate traffic better and replace aging conventional buses. In contrast to the small or medium-sized buses common to traditional Latin American mass transit systems, most BRT systems employ articulated “bendy” buses that are double the length of normal buses. The tough plastic fold linking the two buses increases maneuverability, while the greater passenger capacity per bus reduces congestion and transit time. These buses replace, not displace, older buses: it is standard practice for BRT implementers to buy up and scrap old buses by the thousands, drastically reducing city fleets in a single stroke. In Bogotá, the Transmilenio BRT project replaced 1500 aging buses with approximately 700 new buses, while elsewhere, Santiago’s Transantiago project scrapped 4,100 out of 9,000 regular buses upon implementation. Reducing bus numbers reduces congestion, curtails pollution, and helps prevent an overflow of buses into areas not serviced by the new BRT line(s). Bogotá: Double lanes at stops permit express buses to pass at stations while “bendy” articulated buses allow greater passenger capacity per bus. Passengers access stations via walkways which bridge highways. Cooperative mechanisms between normal bus operators and BRT systems further help to reduce congestion and streamline transit functions. Typical BRT systems ferry passengers along a linear “trunk” route servicing the most economically important, high-traffic areas of a city. Trunk lines almost invariably run along highways or principal avenues. Bus stations are in turn connected to outlying areas by “feeder” bus lines which carry travelers to the more rapid trunk line. Bus drivers on these feeder lines are paid based on how quickly they complete their route, not how many passengers they pick up, eliminating the dangers of competitive compensation schemes. Most feeder lines simply pick up and deposit passengers on a nearby street, but important stops—generally those at the end of a trunk line—may feature large terminals connecting the trunk line with an array of feeder lines. Particularly well-developed systems feature multiple trunks, subsidiary branches of the main trunk, or even a complex, interweaving network of trunk lines. Importantly, most BRT systems allow riders to transfer between feeder lines and trunk lines for free, or at least at a reduced fare. In societies where ten dollars can constitute a good day’s wages, a fifty-cent fare reduction each way greatly reduces the financial burden of transit on the poor. A key ingredient to the success and popularity of BRT systems is their modern appearance. From BRT’s very inception, implementers have placed particular emphasis on the design aspects of BRT, endowing buses, stations and other infrastructure with attractive logos, clean buses, sleek designs, and advanced technology in an effort to set BRT systems apart from the generally ramshackle appearance and poor mechanical condition of traditional Latin American buses. The public response to this approach has been overwhelmingly positive. Largely because of the focus on appearance, new systems are celebrated not only for their efficiency and congestion reduction, but also as popular symbols of modernity. They evoke civic pride, and can even be iconic images for their city: Curitiba’s celebrated cylindrical “tube” bus stations are the most visible symbol of the city. Furthermore, and despite the importance of the automobile as a status symbol in Latin America, clean, modern bus systems have proven effective at attracting middle-class passengers and tourists who might otherwise avoid public transit in favor of their cars. Curitiba: High-rise towers flank iconic tubular bus stations. Note the modern buses. The system comes at a remarkably low cost. A kilometer of BRT infrastructure costs, on average, approximately $2.9 million, whereas light rail costs average $70 million per kilometer. Bogotá’s city government, for example, seriously considered a light rail system in the late 1990s before it settled on the BRT system that came to be known as Transmilenio. The deciding factor was the cost differential: Transmilenio—an expensive system by Latin American standards—costs only $5.8 million per kilometer while light rail was projected to cost $101 million per kilometer. Elsewhere, BRT has been even cheaper, costing $1.2 million per km, $2.7 million per km, and $2.3 million per km for systems in Quito, Guayaquil, and Santiago, respectively. Low cost does not imply substandard construction: the cheapest BRT system in Latin America, Quito’s Ecovía, has been a rousing success, while the (at least initially) most problematic, Transantiago, cost nearly twice as much. Transantiago’s initial failures were the result of poor implementation, not tight budgeting. Overall, the high return on investment offered by BRT is crucial to cash-strapped Latin American municipalities and national governments desperate to improve their burgeoning cities. Bus Rapid Transit has measurably improved most cities that have adopted it, most notably by lessening traffic congestion. BRT buses move faster than traditional systems, which usually move at about ten kilometers per hour (kph) and in some cities reach lows of five kph at peak times. By contrast, Transmilenio local buses average twenty-one kph and express buses average thirty-two kph—faster than many developing world metro systems. This has decreased the average travel time in Bogotá by fifteen minutes per trip and has dropped overall transit times by an estimated thirty-two percent in the first year of Transmilenio’s operation. 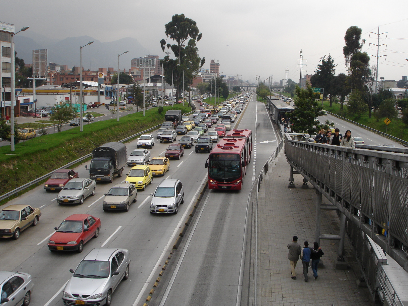 In 1995, immediately prior to the implementation of Quito’sTrolé BRT system, traffic averaged six kph on Avenida 10 de Agosto, the future site of the Trolé. Trolé buses, by contrast, now average fourteen kph. Bus ridership levels have also increased as commuters have been persuaded to forsake their cars for buses. As of February 2008, with only twenty-five percent of the system in operation, Transmilenio trips accounted for eighteen percent of the total trips in the city, ferrying an estimated 1.3 million passengers per day. Moreover, fifteen percent of those passengers were former car users who switched to bus transit, despite the aforementioned middle-class affinity for cars in Latin America. Elsewhere, Curitiba has the second-highest rate of car ownership in Brazil, yet the lowest gasoline usage, since most Curitibans elect to use the far more convenient bus system. Cities with BRT systems have witnessed precipitous drops in traffic-related deaths and injuries. Bogotá saw traffic-related injuries on its Transmilenio corridors drop seventy-six percent and saw fatalities drop by ninety-four percent in the two years following its implementation. These astounding improvements derive from more manageable numbers of city buses on the road and safer bus driver compensation schemes. Furthermore, physically separating buses from cars reduced the danger posed by reckless bus drivers to pedestrians and other drivers. Bus Rapid Transit can also decrease pollution and open transit to disabled persons. Although BRT buses are not typically low-emission—recent efforts to create “green” buses notwithstanding—the concomitant purchase and demolition of thousands of traditional buses has ameliorated the horrific air quality of many Latin American cities. Additionally, comparing pollution readings taken before and after BRT implementation suggests that pollution levels improve significantly on BRT corridors. While vehicular emissions in Bogota as a whole rose twenty-three percent from 2000-20002, they fell eleven percent in Transmilenio corridors. This is especially significant given that the major arteries these corridors occupy host a disproportionate share of workers and residents. A study in Quito found that twenty-three percent of the population lives on or off of major traffic arteries, and a further thirteen percent work along them in formal and informal jobs. On a separate note, inclusive design has made BRT the first instance of bus mass transit in Latin American that is widely accessible to the disabled, helping to open up cities to a previously marginalized group. Additionally, some cities have used BRT as an engine for economic development. It solves the classic bus-based development problem of spatial diffusion, wherein high numbers of bus stops thwart efforts to concentrate development in select areas. 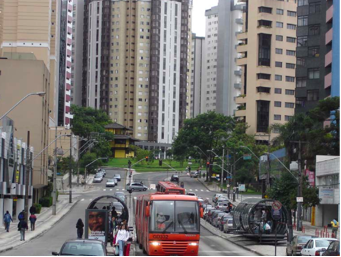 BRT’s linear routes and comparatively few stations facilitate the concentration of economic development along routes, as in Curitiba, where high-value high-rise buildings flank many of the city’s BRT routes. In Bogotá, studies have shown that residential and commercial land values rise along BRT corridors, fueling property booms (and, it must be added, gentrification). Given the youth of most Latin American BRT systems, policymakers retain considerable latitude to foster similar economic booms along their trunk routes. Accomplishments aside, poor design and implementation of BRT can easily create negative externalities. BRT has been criticized for having a barrier effect, dividing cities along BRT-serviced streets and making it harder for pedestrians to cross. In Saõ Paulo, complaints center on the “wall of buses” effect, a reference to how extra-long articulated buses visually separate the two sides of trunk streets. Elsewhere, insufficient scrapping of old buses can trigger congestion on the new feeder routes. Studies have shown that congestion actually increased in areas serviced by Transmilenio feeder routes post-implementation, as displaced normal buses crowded into these neighborhoods. Predictably, average travel times in these areas increased. Although research is lacking, this spillover effect may fuel aforementioned sharp disparity between readings of vehicular emissions on and off of Transmilenio. Finally, despite the optimism expressed above, it remains a certainty that few BRT systems have matched the developmental potential of light rail or metro systems. Over the past thirty-five years, Bus Rapid Transit has blossomed from a niche technology unique to Curitiba to the most popular, cost-effective transit strategy in urban Latin America. Ambitious design and substantial political investment by urban policymakers have effected a minor revolution in the way Latin American cities are traversed, improving speed and safety at a reasonable cost. In the process, Latin American cities have begun to modernize, instilling professionalism and cleanliness in a notoriously rambunctious urban environment. Furthermore, as Bus Rapid Transit has spread to cities throughout the continent, so has its design improved: city planners have progressed from the crude linear designs of Quito’s Trolé to the multi-trunk model of the Transantiago. In a development which will be explored more in the second section of this report, cities are showing increasing sophistication in effectively managing the transition to Bus Rapid Transit systems. All this being said, Bus Rapid Transit is not one unblemished success story. Problems have emerged, particularly in the implementation phase, and have been resolved with varying degrees of success. Given the increasingly global range of BRT systems, an analysis of these problems is overdue. The second part of this report will attempt to provide this analysis and judge policymakers’ responses. Ultimately, it will deliver a concise set of policy recommendations for BRT adopters. Only through careful study of prior adjustments and a comprehensive cost-benefit analysis can the entire potential of Bus Rapid Transit be realized.